Utilising fashion as a vehicle for social commentary, Matthew Miller AW17 took to London Fashion Week on January 7th to exhibit clothing-as-canvas, focussing on fear itself to suggest the dire state of the post-truth era that last year became notorious for. Keeping within the theme, the show embodied an unnerving tone. Models crying tears of blood with their faces contoured with blood red paint featured, perhaps to allude to the bloodshed this year. This sense of discomfort was complemented with predominantly dark colours, supporting the harrowing tones and associations with the concept of fear itself. Besides the impactful and somewhat appropriate concept, the displayed clothing was edgy whilst retaining a functional purpose. 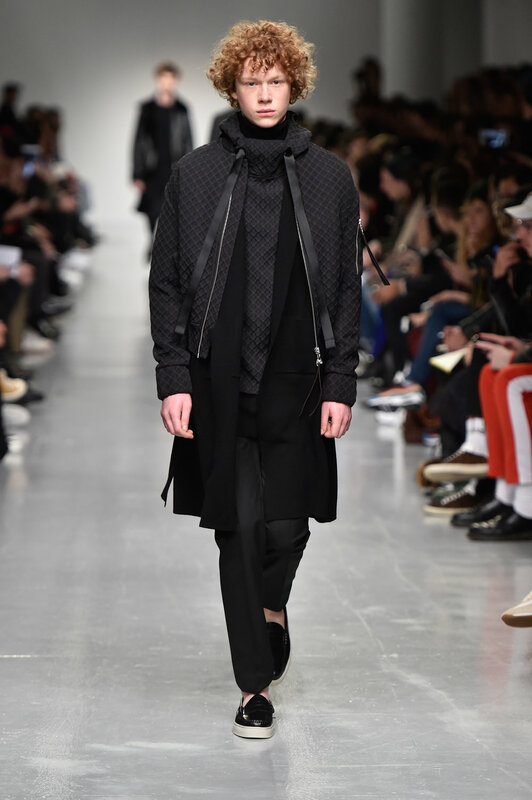 Nylon bombers in deep greys and blacks were amongst the collection, as were overcoats, projecting a more current twist onto an otherwise classic form of outerwear. 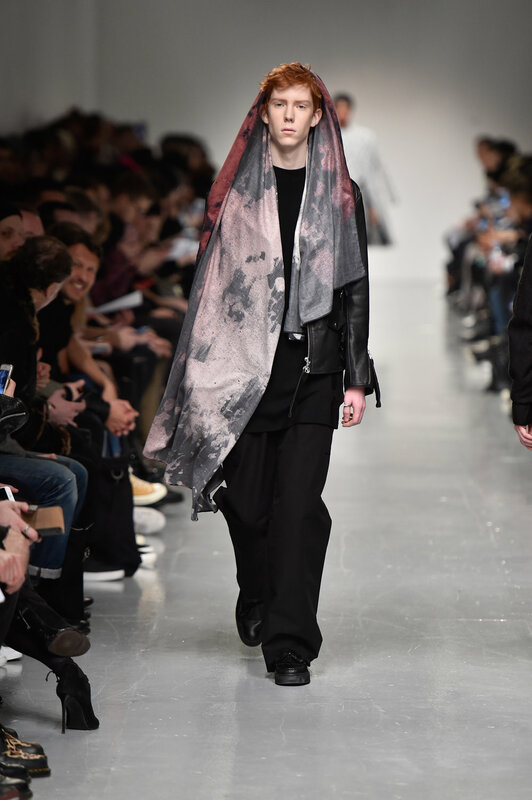 Most notable were the long flowing scarves worn by the models; featuring patterned dyes and prints, the scarves were fluid against the uniformity of the clothing, injecting a sense of contrast and colour, and creating an outfit that caught the eye for numerous reasons. 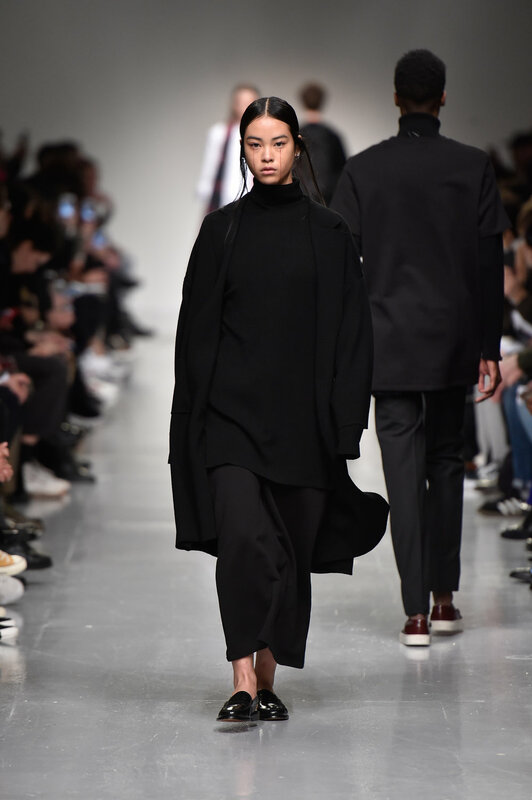 Concretized in a tone that can only be described as thought provoking, Matthew Miller AW17 exhibited outfits that possessed classical, edgy, dark and bright elements, creating ensembles with numerous facets to be appreciated. This was most effectively observed in a two piece outfit consisting of a large dark jacket and trousers, embellished with greyscale circle patterns, which created an eye catching form.